Progressive Theology - Exegete the World! What's the point of having a blog if you don't promote your own book? or buy Christianity: The ebook (same text, more illustrations). Is America over? It's a kind of paranoia, but it's the paranoia of the superrich and the superpowerful. If you don't have everything, it's a disaster. 19 November 2011, BREAKING NEWS: James O'Keefe a Secret Mole of the Left! 5 November 2008, What Does Barack Obama's Victory Mean? 20 March 2008, Militias or Private Arsenals--What Does the Second Amendment Mean? The Saturday Night Theologian is on hiatus until October. Progressive Theology is a blog that offers comments and musings on theology, politics, and more. It includes serious articles, satire, humor, poetry, interviews with famous people (living or dead), etc. Notification of New Articles: Subscribe to the RSS feed to receive notification on new articles and other new material on PT. NEW!!! 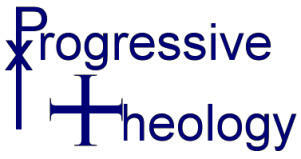 Submissions: People may submit material to be considered for publication in Progressive Theology. For submissions to be considered, they must meet the following three criteria. (1) The content must be consistent with the overall thrust of Progressive Theology. In particular, submissions should take into account the Principles laid out on the home page. (2) The literary style should be of a high quality, comparable to that of higher-quality newspapers or scholarly journals. (3) All submissions should be in text-only format. Material that should be displayed in italics should be entered <i>like this</i>, and material that should be displayed in boldface should be entered <b>like this</b>. For those who know HTML, use character entities, but no tags other than those just mentioned. Send all questions or submissions to tmundo@progressivetheology.org. Tod O. L. Mundo is the nom de plume of James R. Adair, Director of the Religion and Technology Center.